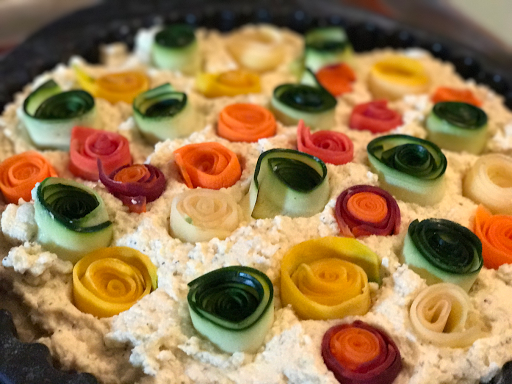 A few weeks back I came across a savory tart recipe, called Rainbow Rose Tart. I thought that's beautiful, but I'll never make it. Well the damn thing kept popping up everywhere I looked. So I looked into the recipe and then realized that it didn't involve much and with our CSA recently delivering the rainbow carrots, why not make it. And just in time for Easter. Unfold a puff pastry sheet over a tart pan. Place parchment paper or foil in the center and weight it down with beans or pie weight. Bake the tart base in a preheated oven at 350°F for 15-20 minutes. Remove the weights and parchment paper. Let it cool. Raise over temp to 375°F. In a food processor, add the eggs, ricotta, grated parmesan cheese, grated nutmeg and pinch of salt. Pulse until smooth. Add the mozzarella and oregano. Pulse mixture until smooth. Slice strips of zucchini and carrots length-wise using a vegetable peeler or a mandolin. Place the slices in a bowl and cook in the microwave for 1-2 minutes. This step will soften the slices and make them much easier to roll. Spread the cheese mixture on top of the tart base. Take one slice of a vegetable and roll it up very tightly; this will form the core of the rose. Take another slice and keep rolling. With around 2-3 slices you should obtain a decent-size rose bud. Place the bud in the center of the tart, pushing it down into the cheese. 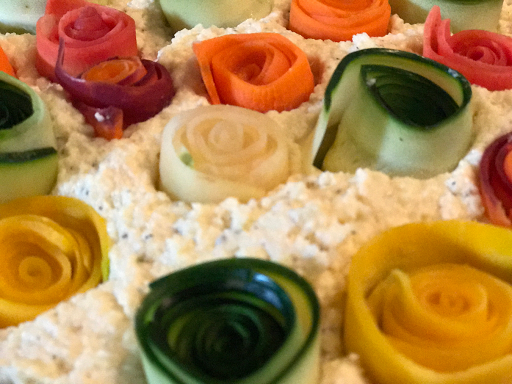 Keep rolling roses of different colors and place them one next to the other in a spiral formation. 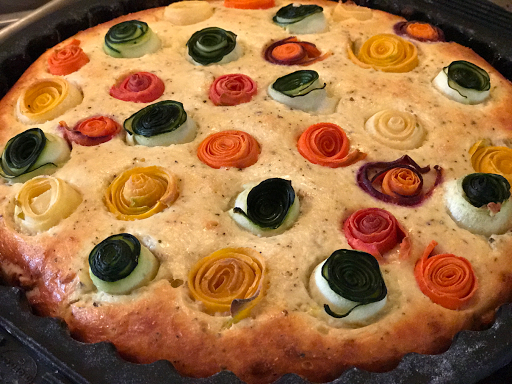 Brush olive oil on top of the vegetables and bake the tart at 375 degrees F for 50 minutes. make sure you use large carrots. And have an even selection of colors. Use the pie weights. The sides of my pastry fell while baking. I improvised and it came out undetected. Rolling the "roses" takes time. Allow yourself plenty of time! I rolled all of the roses up, the placed according to how many colors I had. I used a vegetable peeler. Next time I might use the mandolin. The first piece needs to be paper thin to get the right tightness. Next time I might use thyme in place of the oregano. Might try a couple of tomatoes next time. 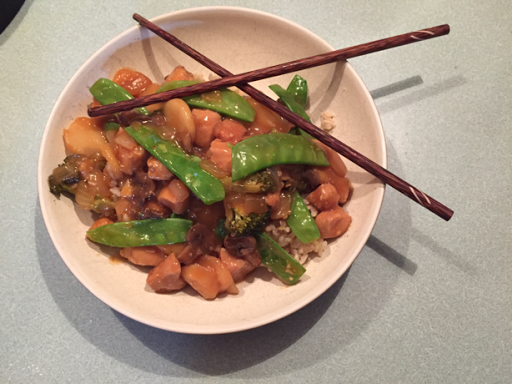 One of my favorite quick go to dinners is Teriyaki Chicken. It's quick, so easy and customizable to your taste. Living in he Seattle area, you can get Teriyaki anywhere. It's almost like the Starbucks of Asian food. Some are good, others are great, everyone has their favorite. What I find is that all are way too salty for me. Soy sauce is arguably the most used condiment in the world. Soy sauce is the product of fermented boiled soy beans. Soy sauce was originally a way to stretch salt and fermented with fish. Fish was separated from the process, and created fish sauce as a separate ingredient. Soy sauce was first introduced to the Webster culture in the Netherlands, decades before Asian foods were introduced, and the Europeans couldn't reproduce it, as they didn't understand the fermentation process, developed by the Chinese. Dark refers to a thicker darker style. This is more common in the US. There is a different style for almost every Asian region. From Chinese (where soy originated) to Burmese, Filipino, Hawaiian, Indonesian, Japanese, Korean, Malaysian, Singaporean, Taiwanese, Thai, & Vietnamese. And multiple styles within each region. The word teriyaki derives from the word "Teri" which refers to a shine or luster given by the sugar content in the sauce, and yaki, which refers to the cooking method of grilling or broiling. Traditionally the meat is dipped in or brushed with sauce several times during cooking. This popular dish was originally created by Japanese cooks of the seventeenth century, when urbanization, changes in agricultural methods and exposure to new ingredients from abroad gave rise to new, innovative cooking styles. Prepare pan by heating oil. 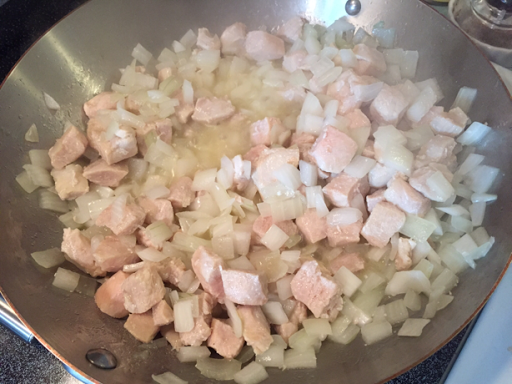 Carefully add chicken and onions. 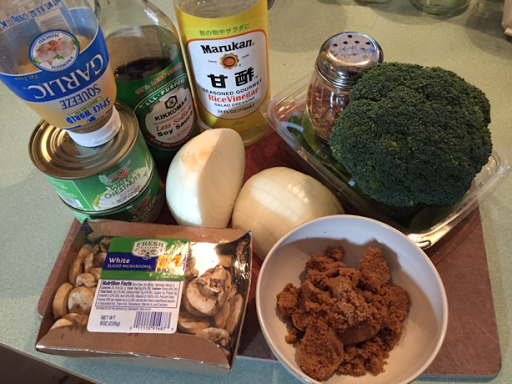 Once the chicken is cooked and onions are translucent, add Mushrooms and Broccoli. Cook 3-4 minutes, constantly stirring. Add in sauce mixture and stir. Before serving, add water chestnuts and snow peas. Serve over rice.